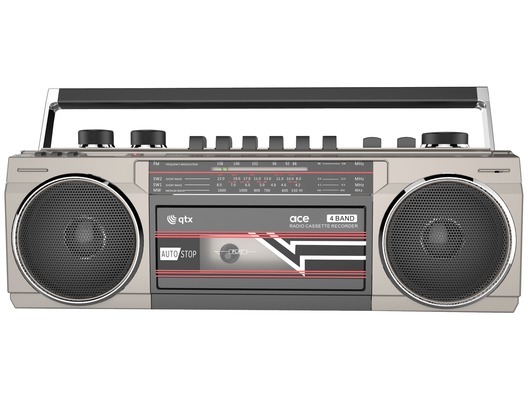 The QTX Ace is an all-in-one retro-style portable music player, modelled after the boomboxes of the 70s and 80s. For the purists among us it is equipped with a classic auto-stop cassette player, which can additionally record audio from the Ace's integrated microphone, radio or USB/SD card. For those of a more modern mind, it also features an MP3 media player with USB and SD ports plus Bluetooth connectivity, so you can wirelessly stream music from your smartphone, tablet or whichever compatible device you choose. The Ace's versatility doesn't end there, as it also has an in-built radio with a telescopic antenna which tunes in to FM, MW, SW1 and SW bands, plus a 3.5mm socket for plugging in headphones.